During World War II, the Nazis fueled children’s enthusiasm for both their war effort and genocide partly by stocking toy stores with cheerful-looking but insidious board games. As budding potential members of the Hitler Youth rolled dice, they competed with miniature weaponry to conquer Allied lands and clear gaming boards of pieces depicting caricatures of helpless or greedy Jews. After the war, German families tossed out the incriminating games in untold numbers, but in the last few years dozens have surfaced in institutional collections and on the market. 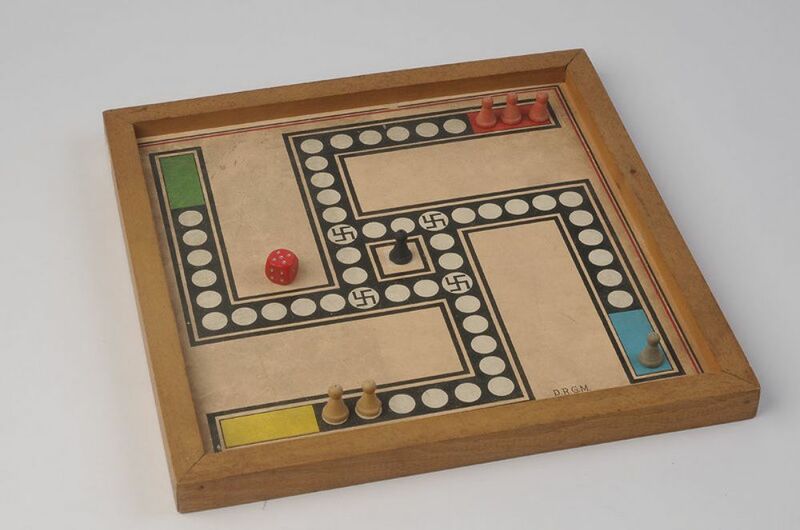 Swastikas studded the path to victory on a pachisi game made in Germany. 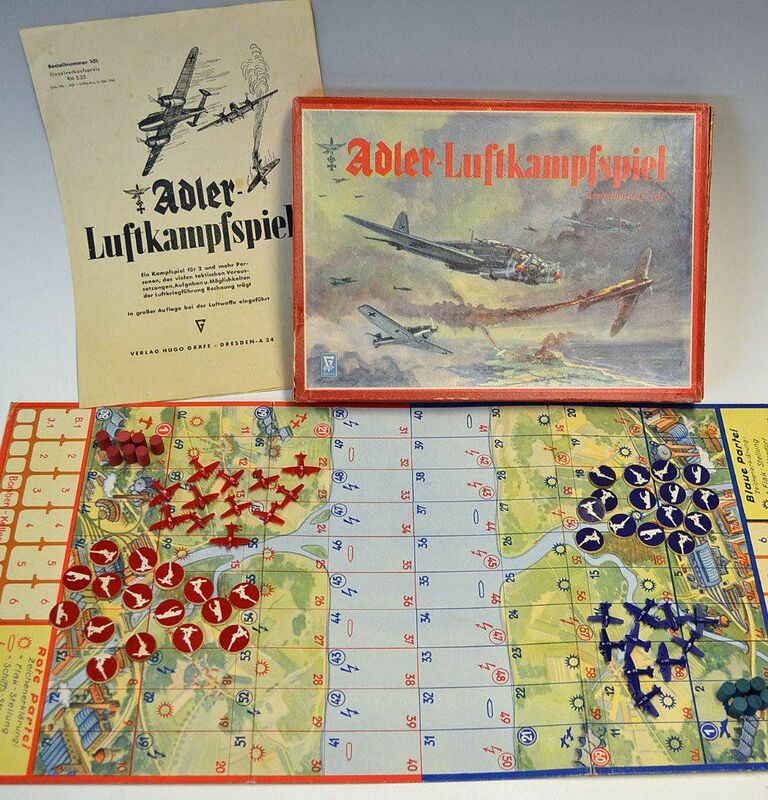 In Wir Fahren Gegen Engeland (“We Are Driving Against England”), players invaded England using make-believe U-Boats, while in Adler Luftkampfspiel players could act out their own bombing raid. Other war-centric board games of the Third Reich included Der Adler, an air-defence game, and this unusual military chess game. Darkest of all though was a board game that depicted soldiers being rewarded for turning in Jews. This board game for children from about 1941 depicts a bombing raid. Using special dice that specifies particular flying movements, bombing and outbreaks of fire, the players have to drop their bomb loads, avoid anti-aircraft flak and reach the other side of the board. 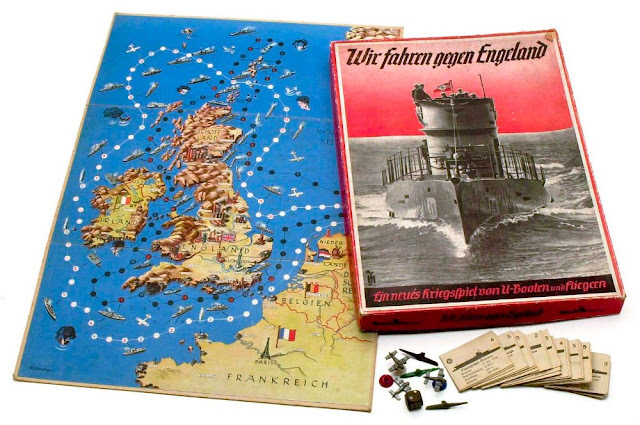 This board game produced around 1939 enabled the players to invade England using submarines (U-boats) and aircraft. Militarism permeated all levels of German society under the Nazi regime.